What will the amphitheater look like? The multi-tiered, semi-circular structure will be surrounded by stonework and natural landscaping. It’s been designed to work for smaller groups as well as serving its full 500-person capacity and will feature a portable, storable bandshell. Why are we building the amphitheater at Lenape Elementary rather than another site? The original idea for the amphitheater came from Lenape staff to support arts in the curriculum at the school, which currently does not have a dedicated performance space for its students in grades 3 to 5. Additionally, the natural slope of the hillside behind the school building is an ideal and cost-effective location for this type of amphitheater. There’s also ample free parking. What will it cost to build the amphitheater? The estimated cost of the project is $125,000. To cover any unexpected contingencies, the committee has set its fundraising goal at $150,000. Because much of the construction labor will be donated by the project’s builder, New Paltz’s own Masseo Landscape Inc, this estimate reflects a significant discount. Will our school taxes be used for construction? Is this part of the NPCSD Capital Project? Absolutely NO tax dollars will be used for this project, and it is not part of the Capital Project. 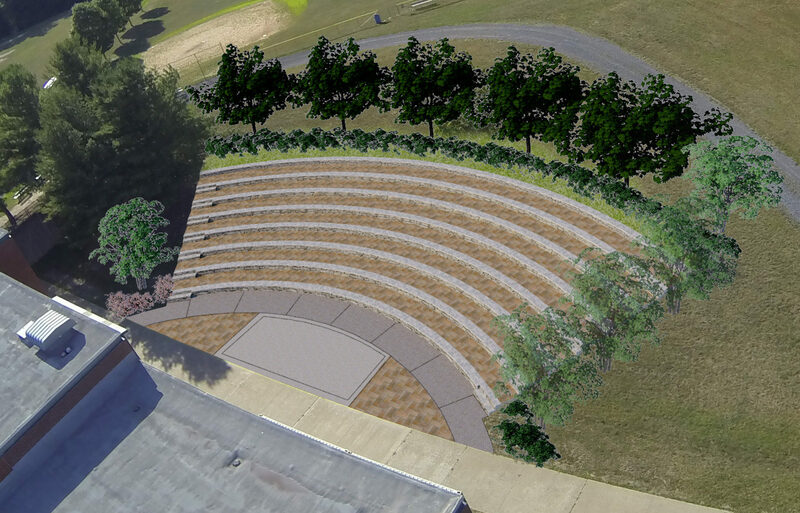 The amphitheater will be 100% funded by donations raised by the Duzine/Lenape PTA. Why are we building an amphitheater when school budget cuts have eliminated staff positions, like an elementary librarian? Shouldn’t we be fundraising to reinstate these? The Duzine/Lenape PTA’s primary mission is to provide student enrichment programming for grades K-5, working hard and continuously to raise $35,000 per year for this purpose. The amphitheater project is in line with this mission, while funding contractual staff positions is not. Raising an annual amount equal to a staff position salary is outside the realm of feasibility for our PTA; however, with community commitment and enthusiasm, we do believe it’s possible to raise this one-time construction cost for the amphitheater. Who will be able to use the amphitheater? In addition to staff of all four New Paltz Central School District schools (Duzine, Lenape, New Paltz Middle School, and New Paltz High School), any 501(c)(3) organization will be able to rent the amphitheater. Restrictions on use of the amphitheater are dictated by the New Paltz Board of Education. Planned school-related uses of the amphitheater include: drama, dance, music, puppetry, improvisation, and other types of performance; an outdoor classroom for any subject and grade level; and a setting for the annual 5th Grade Moving Up ceremony.